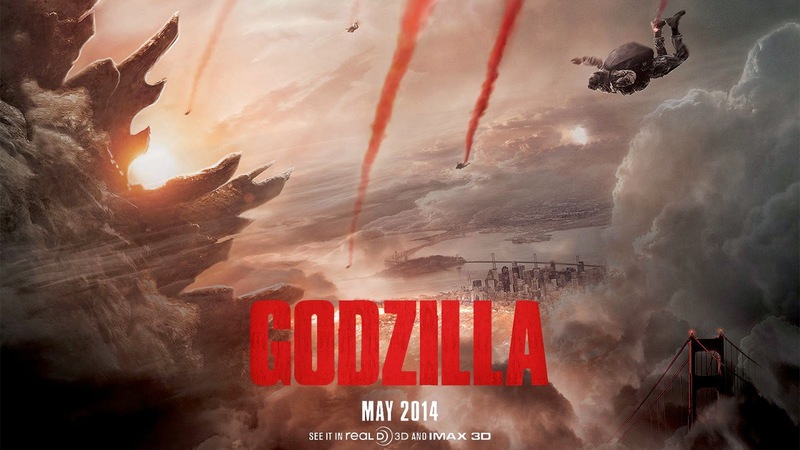 Godzilla (2014) is the latest installment in a long-running tradition of giant-monster films. It is the 4th American Godzilla movie after Roland Emmerich's recent comedy-spiked Jurassic Park knockoff in 1998, and it's the 32nd Godzilla movie since the franchise began in 1954 (all 28 non-American productions were made by Toho Studios in Japan). It's also the second feature film from director Gareth Edwards whose relative success with his no-budget monster flick Monsters (2010) earned him the pilot seat on this $160 million extravaganza. So far the movie has fared well enough with critics and at the box office (more than doubling its production budget at time of posting) to get the green light on a sequel as well as earning Edwards the privilege of directing a Star Wars stand-alone slated for late 2016. What makes this Godzilla so special, and considering that the now-hated previous outing was also commercially successful at its release, will this Godzilla endure? This time around the story follows scientist-slash-conspiracy-theorist Joe Brody (Bryan Cranston) and his ex-military son Ford (Aaron Taylor-Johnson). Ford must travel to Japan when his father Joe is arrested for trespassing in a forbidden zone and the two clash over Joe's conspiracy theories and Ford's desire for a normal life. Ford reluctantly agrees to return to the supposedly irradiated forbidden zone with his father, and just as the two discover the area is free of contamination they are captured by a secret group of government scientists and taken to a lab where they witness the birth of something neither of them expected. It's difficult to discuss the plot of Godzilla without edging into spoiler territory because there's a lot happening from beginning to end, but what's clear about it is that director Gareth Edwards managed to leave his fingerprint on the story despite working with big studios this time around. His previous film Monsters succeeded because it put characters first, it had a slow-burn narrative structure, and it concentrated on the idea that even in the presence of real alien monsters we're more monstrous than they are. These three aspects allowed the film to function on a nonexistent budget of half a million dollars by focusing on the writing. The fact that it builds slowly and is driven by its characters meant the monsters didn't need too much screen time (whereas other low budget monster movies like Cloverfield often utilize shakycam to work within their budgetary restraints), but it also allowed it to succeed as a story without falling into schlocky b-movie territory. With his budget multiplied three hundred times over it's easy to imagine that this sort of restraint and discipline might fall by the wayside, but Edwards maintains this style of storytelling. His characters come first, and as a result there's not as much monster mayhem screen time as in something like Pacific Rim. Instead what we're left with is a more relevant, interesting, and meaningful narrative built on the foundation of human drama. Edwards also has a unique way of making his monsters sympathetic by revealing their motivations and depicting the suffering they feel when their goals aren't achieved. All this helps develop his idea that humanity, which seeks to control nature with destructive force, is the real monster. As Dr. Ichiro Serizawa (Ken Watanabe) explains, "The arrogance of man is thinking nature is in our control and not the other way around." Of course Godzilla is far from a perfect film. Aaron Taylor-Johnson struggles with varying degrees of success to carry the movie's emotional weight on his shoulders, and there's a character twist many audiences will probably dislike. One of the risks of the slow-burn plot structure is that it's easy to run out of meaningful content to fill it with, and there are places where the pacing lags slightly whether due to lack of ideas or lack of action. But overall these shortcoming result from good decisions which simply have difficult consequences, and the finished product is a more thoroughly enjoyable experience because of them. If you're interested then be sure you catch it before it leaves theaters as the scale and quality of the computer animation as well as the sound design for the monsters really brings the film to life on the big screen. - One difficult thing this movie had to deal with was living up to its absolutely phenomenal trailer. Expectations were already high when sci-fi fans learned there was a new Gozilla feature on the horizon, but when that trailer came out it set a bar which no summer blockbuster could top (see also: Prometheus). I still get chills watching it. - If the moment you realize Godzilla is finally charging up his special weapon doesn't have you smiling from ear to ear then you were never truly a child. - If you see this movie and think it doesn't have enough Godzilla you've missed the point. where are the beers and zizeks?!?!?! I increasingly felt that it added nothing and distracted me from focusing on the important part of the reviews (the actual writing). They were a crutch I don't want to rely on anymore. I do still rate movies over on Letterboxd in a somewhat similar fashion despite my ambiguous feelings regarding film ratings. I enjoyed this movie, though I felt it had poor human drama and boring characters. I'd never seen any of the Japanese Godzilla features, not even the first one. I don't think I'll bother. But the new one would be worth seeing again, just to take special note of the camerawork. I definitely agree its weak point is the characters and drama. I really want to watch it again because I remember flip-flopping back and forth about it while I was in the theater, but ending on a high note left me with a good impression. Can't wait for it to come out on home video.